Batman: Upon seeing his parents murdered in front of him as a young boy, Bruce Wayne honed his mind and body into weapons against crime and corruption. With state of the art technology, the sharpest mind of his time, and the peak of human physical prowess, he fights for justice as the Dark Knight, striking fear into the hearts of men. Why He Wins: The Caped Crusader keeps DD at bay with an array of batarangs and smoke pellets, at which point he notices that his adversary is able to dodge or duck everything he throws at him. Deducing that DD has heightened or superhuman senses of some sort, he activates the sonic emitter to attract a flock of bats to throw DD off-balance in mid-leap. The hypersonics confirm Batman’s suspicions of heightened hearing, at which point he uses silent lasers to dispatch or disable Murdock, without ever having to land a punch. Daredevil: Exposed to toxic chemicals as a child, Matt Murdock was initially stricken blind but eventually developed superhuman senses and agility. With his heightened sensory accuracy and sensitivity, he fights for justice in Hell’s Kitchen as the man without fear. Why He Wins: With Daredevil’s moniker being “The Man Without Fear,” and Batman relying on his abiltiy to strike terror into his opponents, the Dark Knight loses an edge. Batman may use an assortment of gadgets, but even Bullseye (who supposedly never misses) has a hard time hitting Daredevil — it’ll be impossible for Batman to hit him with anything. Given all that, this will become a straight-up fist fight. Physically, both heroes are in peak condition. 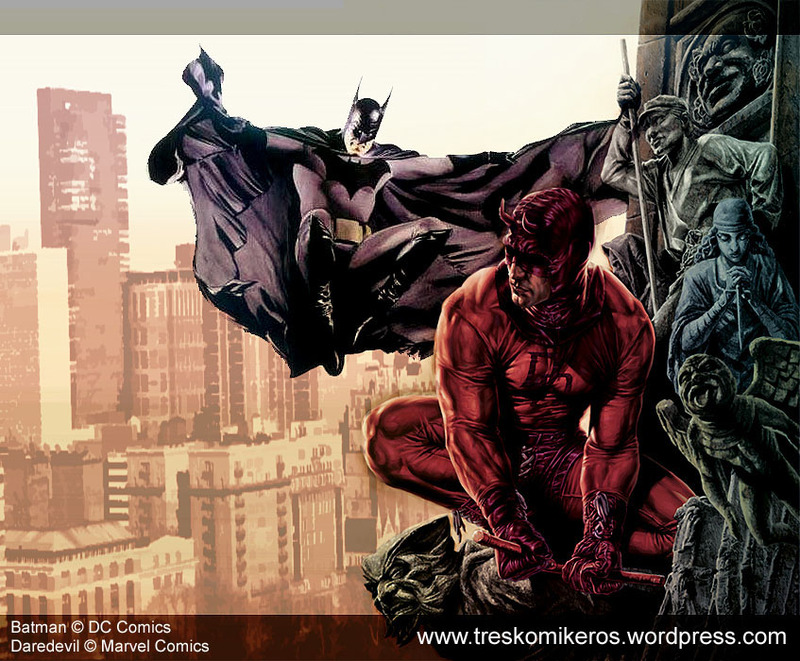 Batman is physically stronger, while Daredevil is more agile. Daredevil will be able to see everything Batman throws at him coming, and without any intel on each other, it’s impossible to figure out that Daredevil is, in fact, blind… since nothing he does in costume hints at it. Evenly matched, it all comes down to who has powers. And Batman is simply all too human against a devil. This is turning out to be a popularity contest. Come on, people. DD could totally take out Bats!!! Well, everyone knows that in the end, Batman always wins. Even Chuck Norris can’t beat The Bat. Using the fear tactic to define Batman – an argument that works only if you’re a purist. Batman has been in plenty of situations where that “advantage” is nonexistent, but he’ll still win over DD any day. This is especially true since we’re not talking about a good guy vs villain fight, where there’s supposed to be a factor of fear. I agree, it’ll come down to a fistfight – and in my humble opinion, the one with more training (and definitely knows more martial art forms and therefore have a better perspective, pun not intended) wins over the one who just learned through necessity. Besides, Batman’s a sleuth at heart. It’s like playing a game of chess with someone who already worked out all your moves ahead of time. Batman wins.